I bought a dress from Forever 21 last month that I had to return. (It had a tear in the collar. I was sad.) They do not give you your money back there, only store credit. So now I have $30 worth of credit to a store that carries very little that I am interested in wearing. But...they do have nail polish! So I picked up 3 bottles (all shall be shown in a later post.) They have the most unoriginal names ever, by the way. But the colors are nice, the formulas are decent, and for $2.80 I am not complaining. One of the colors I picked up was inauspiciously named "blue-green". It's a beautiful, shimmery duochrome that shifts from blue to green to purpley-pink. It's brilliant and reminds me of mermaids. It is SUPER thin, however. I am betting it will take me five coats to approach what it looks like in the bottle. It's definitely one for layering. 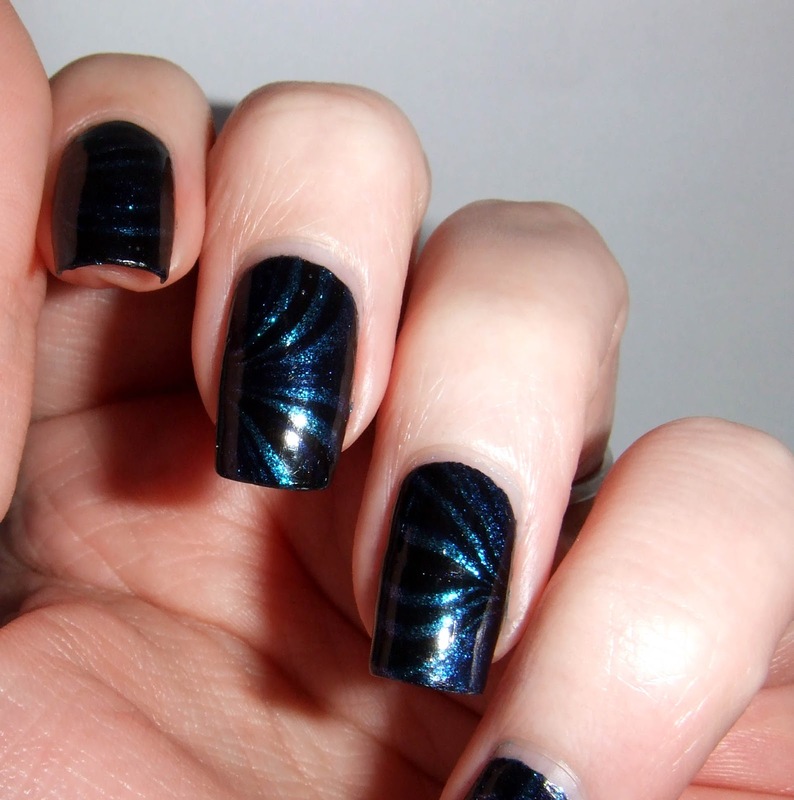 I thought it might look kinda neat water-marbled over navy. And it does. But oh-my-god subtle! In reality, the shiftiness was obvious and neat. My camera refused to catch any of it. It just looks blue. I have a ton of Love and Beauty polishes and I feature a lot of them on my blog. They have a great selection of interesting colors. I haven't had good experience with then marbling though. Maybe it was just the colors I chose? I can see yours and it may be subtle but I'm sure it looks great in real life.